The scalable Delaware map on this page shows the state's major roads and highways as well as its counties and cities, including Dover, the capital city, and Wilmington, the most populous city. To display the map in full-screen mode, click or touch the full screen button. To zoom in on the Delaware state road map, click or touch the plus (+) button; to zoom out, click or touch the minus (-) button. To scroll or pan the zoomed-in map, either (1) use the scroll bars or (2) simply swipe or drag the map in any direction. (The scrolling or panning method you use will depend on your device and browser capabilities.) At any time, you can display the entire Delaware road map in a new window or print this page, including the visible portion of the map. Delaware's Interstate Highways connect its major cities and facilitate travel between Delaware and its neighbors. The state's primary Interstate Highway, I-95, traverses northern Delaware, passing through Wilmington. 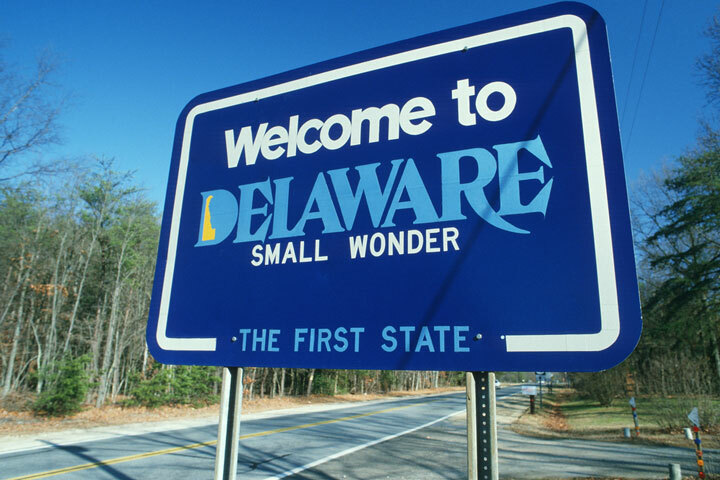 The highway enters Delaware at its western border with Maryland and leaves Delaware at its northeastern border with Pennsylvania. Auxiliary Interstate highway I-295 connects I-95 with the Delaware Memorial Bridge at the New Jersey border. I-495 serves the Wilmington port district, along the Delaware River. In addition to these roads, Delaware's DE-1 limited access toll road runs from I-95 down through central Delaware to Dover, the state capital. Travelers through Delaware's Brandywine Valley can visit the Italian Water Garden, Orchid Display or Children's Garden at Longwood Gardens, visit the ancestral home of Henry Francis Du Pont, or take in some history at the Brandywine Battlefield. This 20-mile meander crosses into Pennsylvania and is a romantic road trip that is pleasant year round, but most spectacular in the spring or fall. More information about scenic roads in Delaware is available on the America's Byways: Delaware web page. Delaware Route 1 connects the Delaware Turnpike near Wilmington with the Atlantic shoreline district. For more information about Delaware's roads and transportation infrastructure, visit the Delaware Department of Transportation website. For Delaware road traffic conditions, visit the Federal Highway Administration's Delaware Traffic Information page.